"You MUST Name and Breed your Darkwolf to expand the family. 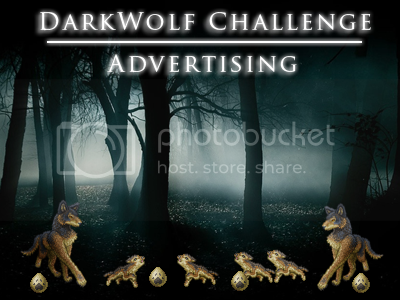 DO NOT SELL YOUR DARKWOLF CHILDREN - IF YOU DO NOT WANT THEM, SEND THEM TO ME OR GIFT THEM TO SOMEONE WHO DOES! SAID PERSON MUST BE PART OF THE CHALLENGE UNTIL AFTER IT IS OVER! No freezing the hatchlings or eggs! The family must grow, not stay as cubs! Kyros and Eirene are totally in love and want to have a large family. But to do this, their children must grow up, find mates and have their own young. And every now and then, an albino is born to the family, and while different, are more than welcome in the family, and encouraged to find their own mates and have more young." From July 6th 2011 to January 6th 2012, you need to breed the lineage as often as possible to help it grow. 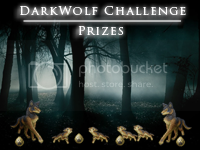 3-Breed Your Darkwolf(ves)! Crossbreeding is ALLOWED! 4-Minimum Inbreeding allowed, prefer none though! 1-You may request one (1) 1st gen Darkwolf to get you started! 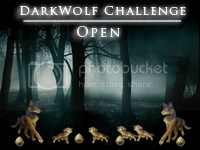 2-Breed your Darkwolf to grow the lineage! 3-After the start of the chaenge, you may request another 1st gen. Those who got 2nd gens for starters will get first choice on 1st gens after the 6th of July! 4-One (1) week before the end of the challenge (roughly around the 25th of December), I will PM everyone to let them know the challenge is ending! 6-Challenge breeding does NOT start until July 6th!! 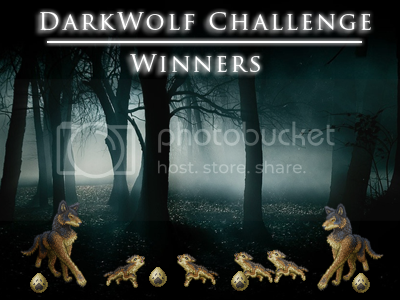 I have helpers breeding offspring to get everyone a Darkwolf before the challenge starts! 7a-Crossbreeding IS allowed! Kyros and Eirene want as big a family as possible, so breeding the offspring with Manticores, Chimeras, Ibex, Koi and Capricorns is open. This will be determined by the challenge tabs everyone has in their keep. 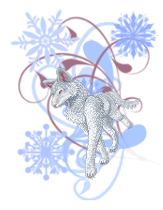 I will count up all the Darkwolves in the tabs, then post the results. This will be determined by the family page itself (which is why I linked it to the Challenge header above). I will go to the highest gen and see who holds it. If there is more than one on the highest gen, I will determine the holder of the Highest Gen by how many of that gen there are and who has the most at that gen. If there is only one at the highest gen, I will look for second place in the next gen down, and see who has that one. There is only one prize for the highest gen category per member in the top three - in other words, no one person will get first, second and third in this challenge. 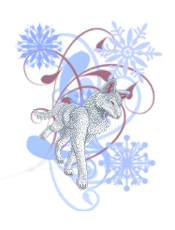 **NOTE - ARTWORK OF THE DIREWOLVES BELONGS TO THE MS ARTIST/SPRITER WHO CREATED THEM. 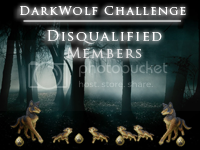 BANNERS, HEADERS AND BUTTONS CREATED BY A CLOSE PERSONAL FRIEND OF MINE, MASTERAARAN, WHO IS NOT A MEMBER OF THIS SITE. PLEASE DO NOT STEAL. Last edited by Eirene on July 14th, 2011, 1:58:52 pm, edited 22 times in total. ALL STARTERS ARE WITH THEIR NEW OWNERS OR IN TRADE. PLEASE MAKE SURE TO ACCEPT TRADES BEFORE THE 6TH, SO YOU CAN START BREEDING! Last edited by Eirene on September 12th, 2011, 9:46:25 am, edited 148 times in total. 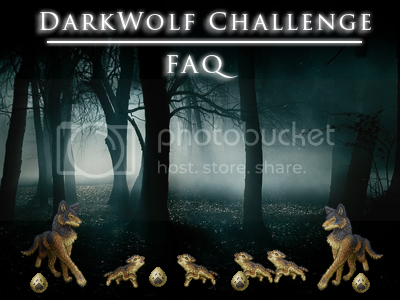 In the form on their first post, where it says total price, please put down "Darkwolf Challenge". I'm sending over enough for the first 1000 stages to be sat with them and will be paying for you guys to get your babies hatched and raised fast. 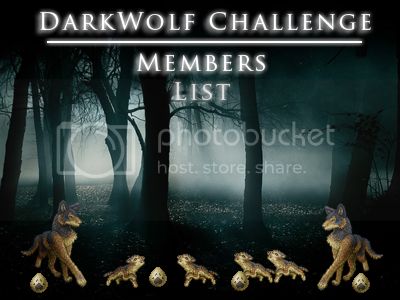 I am also sending awesomeness a list of our members so no one else tries to take advantage of our "subscription" for hatching and raising. Fortworth's daycare. Free sitting. 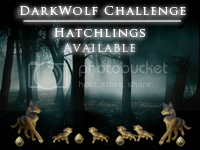 Just post your codes there and let her know if you want to hatchling or adult. Another DWC Member with a free daycare. If you want her to put them into the IFN for you, please state so when posting the codes. Otherwise, they get tweeted and spammed in the click threads. 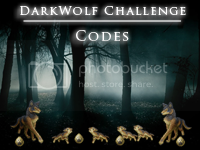 Just post the starting stage and end stage you want and the codes. Last edited by Eirene on September 12th, 2011, 10:29:28 am, edited 74 times in total. Q- Is Inbreeding Allowed? What about Crossbreeding and Hybridization? Q- Are there any special naming requirements? A- No. You can name it any way you like. If you have a specific naming scheme of your own, you may add that to the name, as well as Roman numerals for gens. Q- Do we have to return the lineage at the end of the challenge? A- Not if you have a tab created in your keep for me to look into for the count. 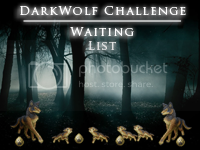 If you want to keep the Darkwolves you have bred, but don't have the room for a tab, let me know, and when you send the trade with them in it for me to count, I will cancel the trade afterwards so you get them back. I will add any other questions that might be pertinent as they are asked. Last edited by Eirene on June 5th, 2011, 5:18:14 pm, edited 7 times in total. Last edited by Eirene on July 2nd, 2011, 12:47:12 am, edited 4 times in total. REGISTRATION IS CLOSED!! Breeding does not begin until 7/6/2011! Last edited by Eirene on July 2nd, 2011, 12:46:24 am, edited 1 time in total. And I'll definitely want the first gen after all's said and done. Myrin wrote: Sign me up please! I might be interested in this, but I have a BIG question. Why do we have to give them all back? You can see who they belong to on the family page.. and it's not like we'd be giving them away, if we're trying to outbreed each other.